Vidyo Screen Recorder is an application for iOS devices that allows iPhone users to capture the entire screen, as well as audio being run on the device while recording the screen. It is work like AirShou, Vidyo works by simulating an AirPlay Mirroring connection. The screen recording apps for iPhone is way more expensive on iTunes than any other apps but you can download Vidyo app for free from this post, and we are going to share the step by step downloading process for each user of this post. We are going share the functionality, features and downloading process with all of you. The best part of this app is that you can install Vidyo app on your iOS devices by using a tool called Cydia Impactor and this method will work for both iOS 9 and 10. If you are looking for an alternative to Vidyo Screen Record then you can go for BB REC Recorder for iOS, this is also a screen recording app and works perfectly with any iOS device. Ok, So now let’s proceed to the Vidyo Screen Recorder download free. As now you know that Vidyo App can do wonder if you a YouTuber, or iPhone freak because it can share your complete iOS experience with your friends and family or your YouTube viewers. As we all know that people today prefer to watch a video instead of reading the long articles. So if you want to teach someone the steps to do any task on your iPad or iPhone then record it via Vidyo Screen Recorder and share the recorded video with your friends. So are you ready to download Vidyo screen recorder app for iPhone? 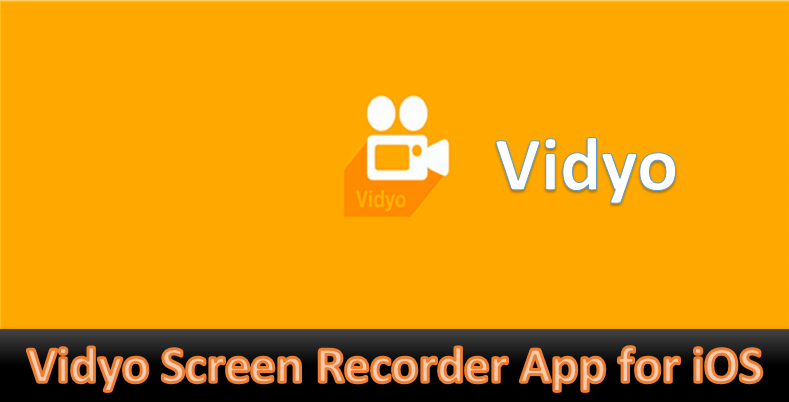 Let’s dog into the proper step by step process to install Vidyo screen recorder application. I will tell you some of the great benefits of the app so you will have a good reason for installing this awesome app on your iPhone. You can download Vidyo app for many purposes and some of them are given below. As I have already told you the main purpose of this amazing application is recording your iOS Device screen. You can record your iOS screen in different resolution whichever fits your needs. Let’s have a look at the benefits of using Vidyo App on your iPhone. The Vidyo app will help you to record your iOS device’s screen in multiple resolutions. You can use Microphone for adding voice in your recording. You can also use the back camera and Front Camera for recording the videos using this app. Vidyo app will allow you to select Max FPS(Capture Frames/Second) on your iOS Device. So above you can see the best benefits of using the Vidyo app on your iPhone or any other iOS devices. Now I will tell you how you can easily download and install Vidyo Screen recorder app on your iPhones or iPads. How to Download and Install Vidyo Screen Recorder on your iPhone? To install Vidyo app, you need Cydia Impactor and in order to use Cydia Impactor app, you need a computer running MacOS, Windows, or Linux. It’s an application that helps users to install IPA files on iOS devices such as iPhone, iPad, iPad mini via your Apple ID. Step #1. Download the Vidyo IPA File [Here]. Step #2. Download Cydia Impactor [Here]. After downloading the compressed file, extract it and launch the main program. Step #3. Connect your device to your computer. Note that you must have iTunes installed on the tool to work. Step #4. Once connected, Cydia Impactor will show you your iOS device name on the app interface. Now open the folder containing Vidyo IPA file, drag and drop the file onto the app interface. You can put your IPA file on the desktop as well. Step #5. Once you drop the file, Cydia Impactor demands an Apple ID and Password. You can use any active Apple Account for this. Step #6. The program will start syncing the IPA file. When you see the warning pop-up, click OK to confirm. It will continue the process and Vidyo will install successfully, you will see its app icon on the home screen. Step #7. Before using it, Now go to Settings > General > Profile & Device Management. From Here, Find the profile corresponding to Vidyo and trust it. We hope you find this post on Vidyo Screen Recorder download free for iPhone, iPad and iPad Mini. If you like this post then doesn’t forget to share this post. If you have any query then drop your questions in the comment section below.